Sometimes, the motivation to cook a certain dish or meal may not necessarily come from a cookbook. 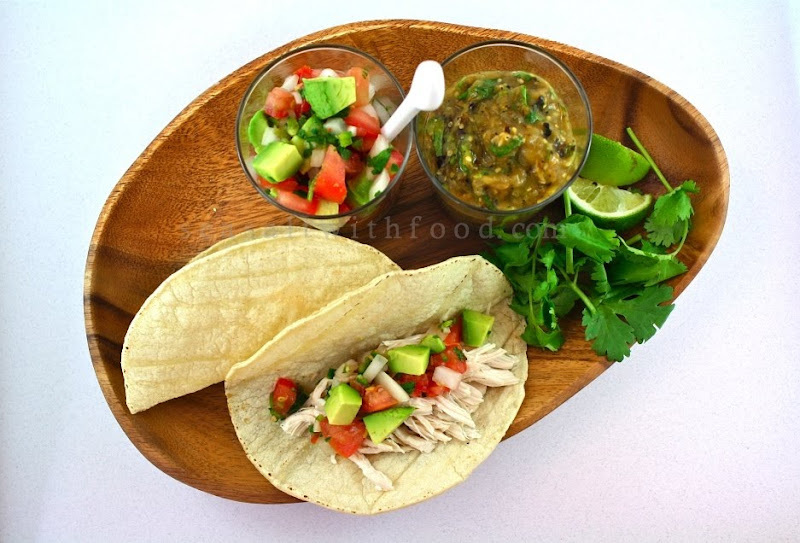 For example, this simple chicken tacos came from one of my visit to a local market stores in Vancouver. I was perusing at a store selling many Mexican food products and thought why not prepare a Mexican meal for a change? So, I started talking to the lady who works at the store about Mexican cuisine and she gave me a few good tips to make a great Mexican meal. In the end, I decided to make some soft tacos with chicken for dinner. I must admit, the tacos turned out really good. In a medium saucepan, place the chicken breast with enough water to cover. Bring it to a boil and reduce the heat and simmer the chicken for about 15 to 20 minutes or until fully cooked. Remove the chicken from the pan and let it cool, and shred. Heat the tortilla in a skillet or grill for about 6 to 8 seconds, or until softened. 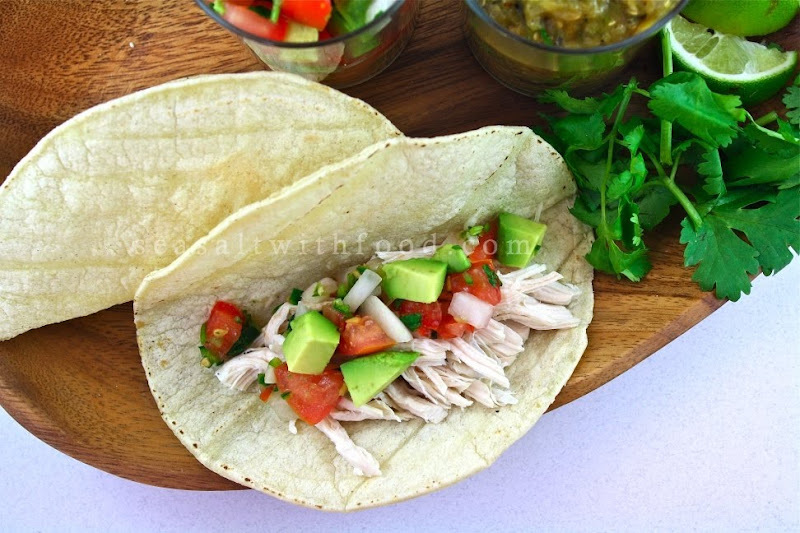 To serve the tacos: Place some shredded chicken on each tortilla, top with both salsa, cilantro and some lime juice. Fold the tortilla in half and serve warm. I'm a local... what store? South China Seas Trading at Granville Island and the other is Cilantro & Jalapeno Gourmet Mexican Foods at Lonsdale Quay Market. 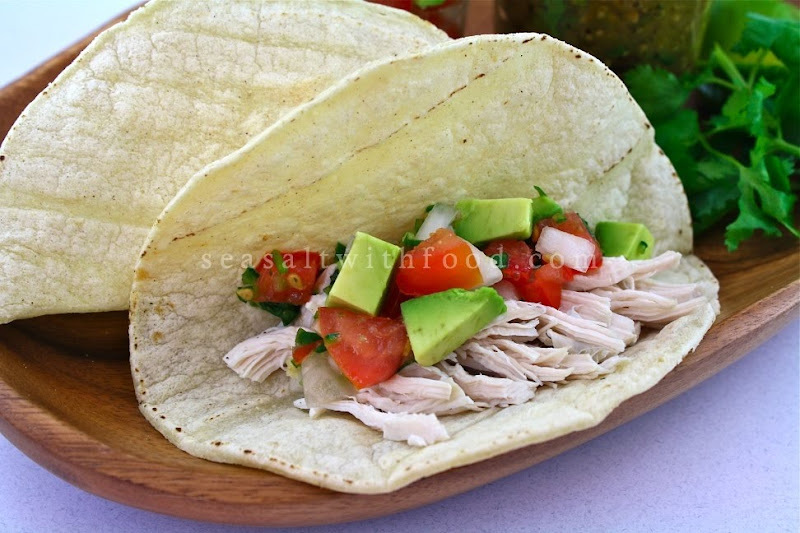 I've been craving tacos for a little while now and this post is not helping the feeling! Looks AMAZING!